Have you ever seen those fleece rope dog toys at the pet stores? Well, my dog loves them. In addition, they aren’t as messy as a typical knotted or hemp type rope where little strings can be left behind. I realized right away that I could make fleece ropes with all the left over fleece from other projects (the trendy term for this is upcycle). I’ve now made more ropes than I can count for my dog and all of her friends. 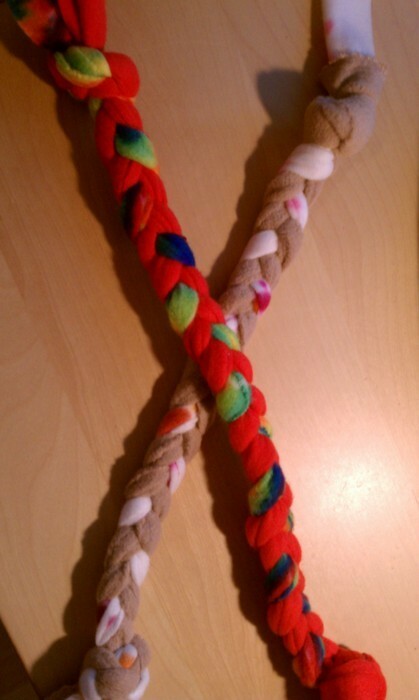 I just completed two new rope gifts for some doggies I’ll be visiting soon. Instructions: cut 3 strips of fleece. The thicker the strip, the thicker the today. Knot at one end. Braid. Knot at the other end. Play tug with a happy dog! ← Making a bike trip to see the knitted trees!